Having friends over is fun and should never be stressful. These recipes I have used time and time again and are delicious, along with being easy to make! 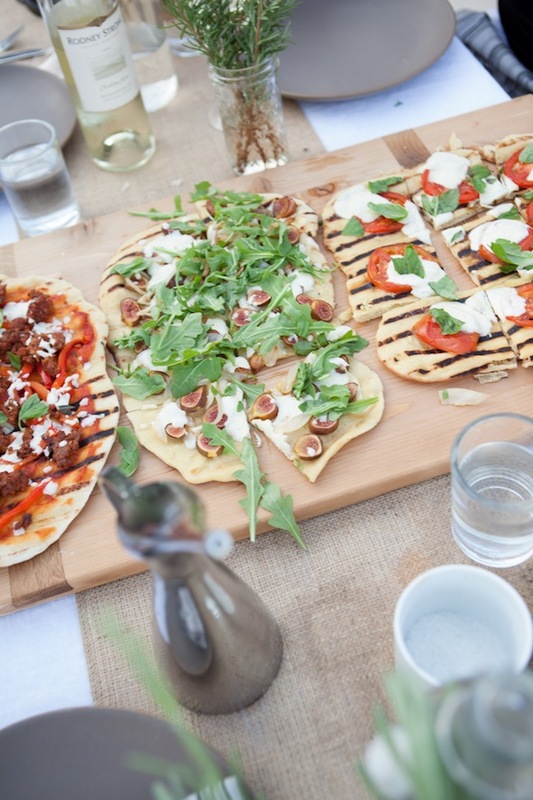 I never need an excuse to eat pizza, everyone loves it and it is a really fun dinner party! I am actually hosting one in a few weeks. I usually buy the pizza dough from Eataly, but you can buy dough from any local pizza place. The best part is getting all the toppings and setting up a little toppings bars. Last time I went crazy on the toppings, but there wasn’t one that no one used! Let everyone get a chance to make one, maybe make it into a little competition? Here is a great article from thekitchn about how to make great pizza at home and Saveur has some menu ideas. Half Baked Harvest has a delicious Spring Time Mushroom + Asparagus White Burrata Cheese Pizza with Balsamic Drizzle that looks to die for! If you live somewhere you can grill check out Camilla Styles recipe above or this post by the Everygirl. Nothing like getting everyone involved in the kitchen and an activity. One of my favorite dinner parties is this one! Figuring out what to cook when your entertaining can sometimes be a challenge. You obviously want to make something friends will rave about enjoy and really you don’t want to be stressed about the cooking, because if you’re stressed, your guests won’t be having as much fun. The whole point of having people over is so you can spend time with them and that is why I love the recipes I have included here, either your guests are involved (pizza party) or majority of the work is done ahead so you can relax and have a glass of wine. Also, recipes made in advance taste better, it is a fact – everything has gotten friendly and it’s just delicious! Not to toot my own horn (and I am not really because it isn’t my recipe, just featured on my site) but these ribs are the best! They are cooked in beer, and are perfect for summer and serving a large group of people! I recently stumbled upon this recipe and am so happy I did. Great for a party, I made this for James and I and we had leftovers for days! What I love about Food52 is all the people who write in about suggestions for the recipe. A lot of people suggested cutting back on the tomato sauce component, I did and and worked out fabulously. I usually cook a recipe a few times before I serve it to guests, I want to make sure it is good and this one was a winner! This is a go-to for me. James’s favorite meal I cook probably and chances are if you have come over for dinner in the past three years with a group, I have served it to you. I also have never gotten a good photo of this dish because people dig in immediately. I think it definitely has to marinate in the refrigerator overnight – the marinade is amazing! I also cook about an hour longer than he recommends. Your whole house will smell amazing and your guests will be blown away with the dish. I think its great for a casual dinner with some coleslaw and cornbread! Everyone loves beef tenderloin and it is such an easy and elegant meal to put together. I change up the marinade depending on the season. Follow Ina’s Filet of Beef Recipe and you will never be disappointed! You will notice a Barefoot Contessa theme here, her recipes are the best. In the summer a favorite marinade is half whole ground mustard and half brown sugar rubbed on the steak about an hour before cooking. One of my favorite recipes ever and so easy to make. I make one small change here from Ina that I personally think makes a huge difference. Where she has 5 cups of chicken broth, I make it four cups of chicken broth and add in one cup of dry Sherry! Other than that in my mind this is the perfect recipe. I have also done homemade biscuits, grands biscuits and they are all delicious. This is a great recipe for a cozy night in with friends. Save the best for last, right? One of my first ever blog posts was on this recipe as my favorite Fall meal. This is the perfect fancy dinner party meal – it is elegant and amazing! I have always loved beef bourguignon but this is the best I have ever had. I love to make this for a dinner party and I think it will knock your guests socks off!